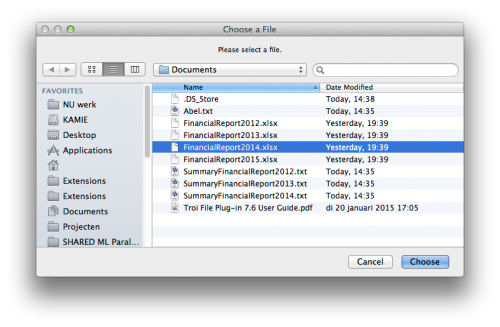 With Troi File Plug-in you can easily let a user select a file on disk, for example to get the contents into filemaker. With the plug-in you can also move or rename it, to indicate the file has been handled. 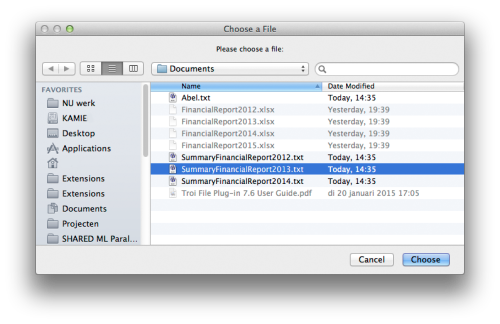 Use the TrFile_SelectFileDialog function to open up a dialog which lets the user select a file. By default all the files can be selected. If you want the user to be able to select only files with a certain extension use the TrFile_SetDefaultType function first. If the user cancels the dialog $$-1 is returned. Now the user can only select .txt files. It is a great and easy way to enhance your database for you or your customers.